بهپژوه, احمد, شکوهی یکتا, محسن, معتمدی شارک, فرزانه, افروز, غلامعلی, غباری بناب, باقر. (1394). ویژگی های روان سنجی پرسشنامه هوشبهر هیجانی بار-آن فرم بلند ویژه نوجوانان. نشریه پژوهش در نظام های آموزشی, 9(30), 7-26. احمد بهپژوه; محسن شکوهی یکتا; فرزانه معتمدی شارک; غلامعلی افروز; باقر غباری بناب. "ویژگی های روان سنجی پرسشنامه هوشبهر هیجانی بار-آن فرم بلند ویژه نوجوانان". نشریه پژوهش در نظام های آموزشی, 9, 30, 1394, 7-26. بهپژوه, احمد, شکوهی یکتا, محسن, معتمدی شارک, فرزانه, افروز, غلامعلی, غباری بناب, باقر. (1394). 'ویژگی های روان سنجی پرسشنامه هوشبهر هیجانی بار-آن فرم بلند ویژه نوجوانان', نشریه پژوهش در نظام های آموزشی, 9(30), pp. 7-26. بهپژوه, احمد, شکوهی یکتا, محسن, معتمدی شارک, فرزانه, افروز, غلامعلی, غباری بناب, باقر. ویژگی های روان سنجی پرسشنامه هوشبهر هیجانی بار-آن فرم بلند ویژه نوجوانان. 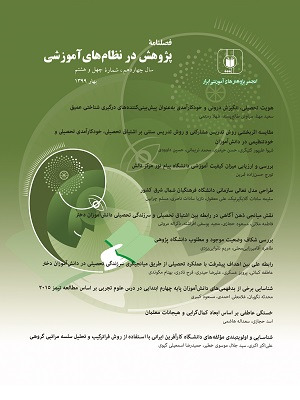 نشریه پژوهش در نظام های آموزشی, 1394; 9(30): 7-26. Al-Qafaas, W. K. (2007). Validity of the Bar-On Emotional Quotient Inventory: Youth Version using both sides of the psychological adjustment. College of Education Journal, University of Benha, 17(70), 1-50, (In Arabic). Al-Said, T. B. T, Birdsey, N. & Stuart-Hamilton ,I. (2013). Psychometric Properties of Bar-on Emotional Quotient Inventory Youth Version among Omani Children. International Journal of Learning Management Systems, 1(2), 13-24. Arndt. J .E. & Fujiwara, E. (2014). Interactions between emotion regulation and mental health. Journal of Psychiatry and Behavioral Sciences, 1(5), 8-16. Bar-On, R. & Parker, J .D. A. (2000). The Bar-On Emotional Quotient Inventory: Youth Version (EQ-i: YV). Technical Manual. Toronto, Canada: Multi-Health Systems. Bar-On, R. (1997). Development of the Bar-On EQ-I: A measure of emotional and social intelligence. Paper presented at the 105th Annual Convention of the American Psychological Association, Chicago, USA. Bar-On, R. (2000). Emotional and social intelligence: Insights from the Emotional Quotient Inventory. In R. Bar-On, & J. D. A. Parker (Eds. ), The handbook of emotional intelligence (pp.363–388). San Francisco: JosseyBass. Bar-On, R. (2006). The Bar-on model of emotional-social intelligence (ESI) Journal of Psicothema, 18, 13-25. Chen, F. S., Lin, Y. M., & Chia An Tu, C.A. (2006) A study of the emotional intelligence and life adjustment of senior high school students. World Transactions on Engineering and Technology Education, 5(3), 473-476. Ciarrochi, J., Forgas, J, P. & Mayer, J, D. (2006). Emotional intelligence in everyday life, A Scientific inquiry. Psychology Press. Second Edition. Davis, S. K. & Humphrey, N. (2012). Emotional intelligence predicts adolescent mental health beyond personality and cognitive ability. Personality and Individual Differences, 52, 144-149. Davis, S. K., & Humphrey, N. (2012). Emotional intelligence predicts adolescent mental health beyond personality and cognitive ability. Personality and Individual Differences, 52, 144-149. Gardner, H. (1983). Frames of mind. The theory of multiple intelligence. New York: Basic Books. Gayathri, N. & Meenakshi, K. (2013). A literature review of emotional intelligence. International Journal of Humanities and Social Science Invention, 2(3), 42- 51. Goleman, D. & Cherniss, C. (2001). The emotional intelligence workplace. How to select for, Measured improve emotional intelligence in individuals, groups and organization. Jossey Bass By Wiley Company. Hassan. K. & Sader. M. (2005) Adapting and Validating the Bar-on EQ–i: YV in the Lebanese Context. International Journal of Testing, 3(5), 301-317. Lane, R. D., Reiman E. M., Axelrod, B., Lang-Sheng, Y., Holmes, A. & Schwarz, G. E. (1998). Neural correlates of levels of emotional awareness: Evidence of an interaction between emotion and attention in anterior cingulated cortex. Journal of Cognitive Neuroscince,10(4), 55-54. Lopes, P. N., Mestre, J. M., Guil, R., Kremenitzer, J. P. & Salovey, P (2012). Managing emotions in adaptation to school: Social behavior and misconduct in the classroom. American Educational Research Journal, 49(4), 710-742. Martins, A., Ramalho, N. & Morin, E. (2010). A comprehensive meta-analysis of the relationship between emotional intelligence and health. Personality and Individual Differences, 49, 554-564. Matthews, G., Zeidner, M. & Roberts R. D. (2002). Emotional intelligence: Science and Myth. Massachusetts Institute of Technology Press. Mayer, J. & Salovey, P. (1997). Emotional intelligence and the construction and regulation of feeling. Applied Preventive Psychology, 4, 197-208. Mayer, J. Salovey, P. & Caruso, D. R. (2004). Emotional intelligence: Theory, findings and implications. Psychological inquiry, 15(3), 197-215. Parker J, D. A., Saklofskeb, D. H., Shaughnessya, P. A., Huangb, S, H. S., Wood, L. M & Eastabrook J, M. (2005). Generalizability of the emotional intelligence construct: A cross-cultural study of North American aboriginal youth emotional intelligence. Personality and Individual Differences, 39(1), 215-227. Parker, J. D. A., Creque Sr. R. E., Barnhart D, L., Harris, J., Majeski, S. A., Wood L. M., Bond, B. J. & Hogan M, J. (2004). Academic achievement in high school: does emotional intelligence matter? Personality and Individual Differences, 37(7), 1321-1330. Rovnak, A. M. (2007). A psychometric investigation of the emotional quotient inventory in adolescent: A construct validation and estimate of stability. A Dissertation Presented to The Graduate Faculty of The University of Akron. In Partial Fulfillment of the Requirements for the Degree Doctor of Philosophy. Salovey, P. & Mayer, J. (1990). Emotional intelligence. Bay wood Publishing Co, Inc.
Schutte, N., Malouff, J., Hall, L., Haggerty, D., Cooper J., Golden, C. & Dornheim. L. (1998). Development and validation of a measure of emotional intelligence. Personality and Individual Differences, 25, 167-177. Shuler, C, S. (2004). An analysis of the emotional inventory: Youth version as a measure of emotional intelligence in children and adolescents. A Dissertation submitted to the Department of Educational Psychology and Learning Systems in partial fulfillment of the requirements for the degree of doctor of Philosophy. The Florida State University College of Education. Sternberg, R. (2004). International Handbook of Intelligence. Cambridge, UK: Cambridge University Press.